Well I know there are a lot of Pasta machines out there gathering dust, as it had been many years for me and I’m not really sure the exact reason why I succumbed to the pursuit of Pasta making again. It certainly wasn’t the economics of it all as store bought pasta is still a relatively inexpensive and affordable food item. It’s also definitely not for the convenience, as it’s fairly time consuming and being preservative free, really doesn’t store well. 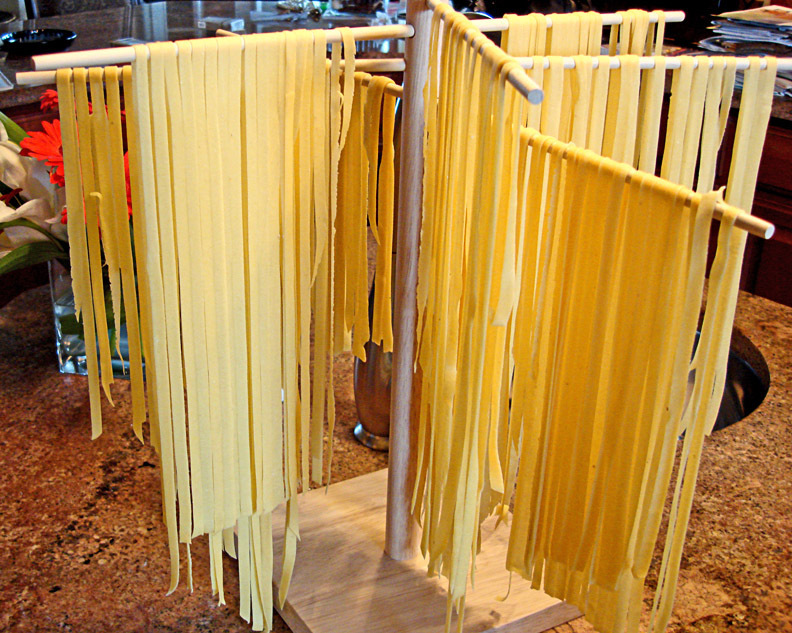 However, there really is something rewarding about looking over a freshly made batch of homemade Pasta sitting drying in your kitchen. You just can’t help but marvel at how it’s possible to transform a mound of flour and a few simple ingredients into this assembly of lovely smooth golden strips. The peaceful tempo of kneading the dough and the quiet attentiveness involved when rolling and cutting the noodles makes this a very relaxing and satisfying distraction for me. But contrary to my relaxation theory, The Emilians, acknowledged masters of home-made pasta, say that your fanny should work up a sweat as you're rolling out the dough! Whatever way you personally interpret the pasta making experience, there is one thing for sure…You can’t beat the lightness and the fresh flavor! 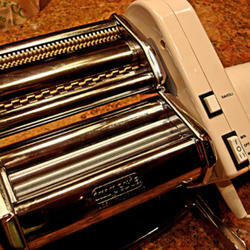 Pasta can totally be made by hand but a hand-rolling machine that also cuts is a huge time saver. These stainless steel models from Italy such as Imperia or Atlas come with a rolling mechanism and usually a couple of different cutter attachments and can be purchased relatively inexpensively. If you want to really make it easy, an optional motor can be purchased for these machines and I find this to be a wonderful addition as you now have 2 hands to work with. 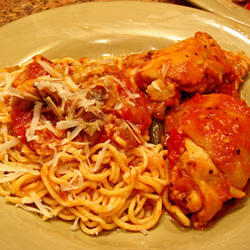 There are so many variations and recipes for Pasta but the two principle ingredients for making a basic egg pasta are flour and eggs. I generally use an all-purpose unbleached flour as it has high gluten content and makes a nice firm dough. I also like using Semolina Flour as I feel it’s easier to work with and in most pasta recipes I make I’ll use half and half of each. In most cases I will use 1 extra large egg to each cup of flour. I also add a little splash of water to the egg if needed, to make ¼ cup of liquid as well as ½ tspn of Olive Oil to keep the dough pliant. If you have a large electronic mixer with a dough hook a lot of time can be saved in the mixing and kneading process. 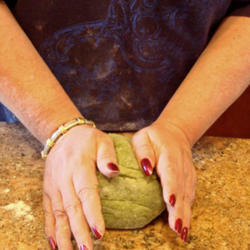 To make dough by hand, place the amount of flour required on a large, flat, non-porous surface. Make a well in the pile of flour and pour the eggs into the well. 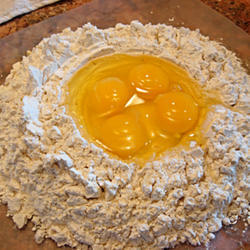 Use a fork to slowly mix the eggs into the flour, pushing it towards the middle to keep the eggs from running out. 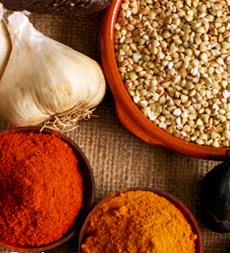 When it becomes too difficult to keep mixing with a fork, start using your hands. Before long you’ll have a nice workable dough, To cut down on the clean-up, I usually use a plastic cutting sheet to mix the initial dough. Begin kneading and continue until the dough becomes firm. I’ll usually knead a 1 lb portion of dough for about 10 minutes and you’ll feel it changing and getting smoother and a dryer the longer you knead. 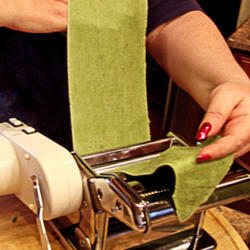 If your dough is sticky you will have problems when you run it through the pasta machine or hand roll it. Add a touch more flour to remedy this. You will know that it’s right when it’s just moist enough that it sticks to itself and nothing else. 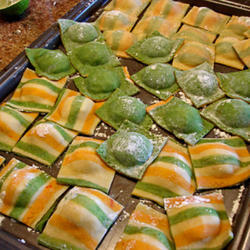 Portion the dough into the amounts you will need to make sheets of pasta. To keep things manageable form the dough into tennis ball-sized balls. 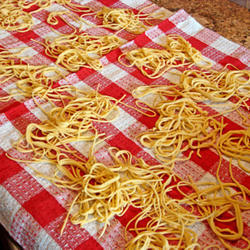 Wrap the pasta well in plastic wrap and set the dough aside at room temperature for at least 45 minutes. 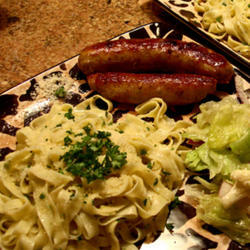 This gives the glutens a chance to rest and unwind, which will make for a more tender pasta. Once the dough has had a chance to rest, cut the tennis ball portions in half and flatten them out. Run them through the widest setting of the machine and then fold each piece in half or thirds, repeating this as you pass then through a couple more times, until they are supple and smooth. Set the rollers one setting closer together and roll each strip through again. Move the rollers closer together and keep rolling it through these settings until you reach the desired thickness. Lay your strips on a clean towel making sure that they don’t overlap. Let them rest for about another 5 minutes which will greatly help the cutting if the sheets are drier. If the strip is too wet it will stick together in the cutting blades and if it’s to dry it will crack. 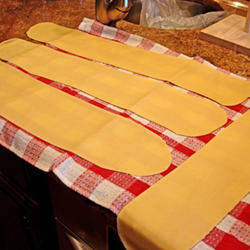 Feed the strips through the cutting blades and once the pasta is cut, lay the noodles on clean towels or over a pasta rack until they’re ready to be cooked. 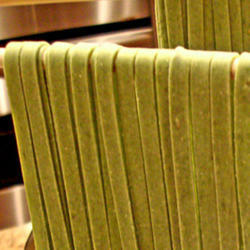 These noodles can be cooked immediately or dried and stored in the refrigerator for about 1 week (or frozen for a month).Fresh pasta cooks much faster than dried. 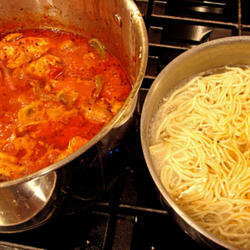 Depending on the thinness of the noodles it can take as little as 3 minutes. Usually when they have floated to the top of the boiling water…they’re done! And of course, if you don’t have a machine…It’s still possible to make this pasta by rolling it out well and cutting it by hand like many generations have done before us! Once a basic pasta dough has been mastered there are so many different types and variations that can be fun to make as well as many tasty dishes!